International workshops aim at bringing together students from various colleges and countries to work on specific briefings for a short period of time. The CAD is part of the “CUMULUS Association” since June 2013. This organisation brings together approximately 200 public and private art colleges throughout the world (http://www.cumulusassociation.org). One goal of this association is to help its members organise those international workshops (1, 2 or 3 weeks in duration). Additionally, CUMULUS also facilitates the exchange of students, or study abroad programs, for part of their studies (from three – six months) with other art colleges around the world. 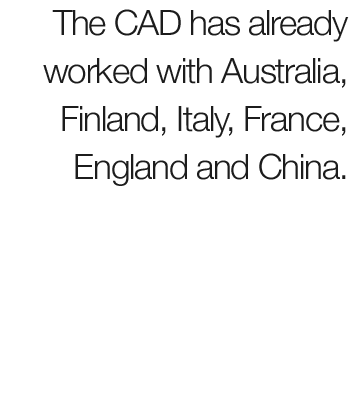 The CAD has already worked with Australia, Finland, Italy, France, England, China, etc. In addition, many other workshops and exchanges are currently being developed. When organised at the CAD 3 times a year, the international multidisciplinary workshops (IMW) combine students in Interior Architecture & Design, Advertising & Digital Design as well as scenography from various colleges and countries. The students are split into teams and must complete a “real world” briefing, culminating to a jury panel on the final day. The official workshop language is English since students come from varying locations, however, part of the challenge (and fun!) is overcoming cultural and language differences in order to create a team product. Every year, students truly enjoy this experience since it brings together new cultures and perspectives in a friendly, intimate environment.